If you were involved in a car wreck and not injured or not seriously injured, you likely don’t need a lawyer to get the claim resolved and move on. I wrote this simple report just for folks like you, that just want to know what to do and the steps that need to be taken. You Don't Always Need A Lawyer For Your Legal Issue, But Free Legal Information Provided By A Lawyer Is Always Useful! If you meet attorney, Russell Button, you will come to know him as a trial lawyer, entrepreneur, a teacher, a tri-athlete, a small business advocate in Dallas, and a non-profit supporter in addition to being an author (even though English was his worst subject in school) who provides free information to those who need it most. Back in 2015, Russell Button was a solo attorney with one paralegal and they used to take every single personal injury and wrongful death case that walked in the door. Since that time he has practiced exclusively in the areas of daycare injuries, car wrecks, and serious personal injuries. Mr. Button concentrates his practice in representing those who are injured by others. Today, The Button Law Firm has two (2) attorneys, a law clerk, a paralegal and a marketing assistant. For the last three (3) years, Russell has worked hard to attract the type of clients that he is proud to represent. Need Your Car Fixed After A Car Wreck? Russell is dedicated to educating Texans about daycare injuries, car wrecks and serious personal injuries cases so families can make great decisions. We believe our clients make better decisions after being informed, which is why we give away so much free information. Before you talk to anyone, make any legal decisions, or sign anything, check out our library of FREE books and articles on daycare injuries, car wrecks, and serious personal injuries. "What am I supposed to do if my child got hurt at daycare?" "Why is the Department of Family Protective Services at my house?" After an incident report has been filled out on the injury, the Department of Family Protective Services will contact you to schedule an appointment with you and your family. Don’t be alarmed or worried. They are on your side and want to help your family. The State will be conducting an investigation to narrow down what happened to your kid. You can read more about it in this article about the Department of Family Protective Services. The best advice we have is to put those medical bills on your health insurance. Those bills can otherwise go to collections and ruin your credit score. Unfortunately, the daycare center will not be financially responsible for the medical payments until after the case is settled. When a case is settled, your medical insurance will collect payment from that settlement. This is called subrogation. In the meantime, make sure to keep every receipt from previous doctor visits. Check out our article: My Child Was Injured At Daycare. Who Pays The Medical Bills? "How can I be sure I’m choosing the correct lawyer for my case?" We give you something to look for in a lawyer. It’s hard to find a lawyer who specializes in daycare negligence cases like we do. We have created a full list of questions to ask a potential lawyer for your child’s daycare negligence case. These questions will ensure you that the potential attorney will fit your case and your family the best. 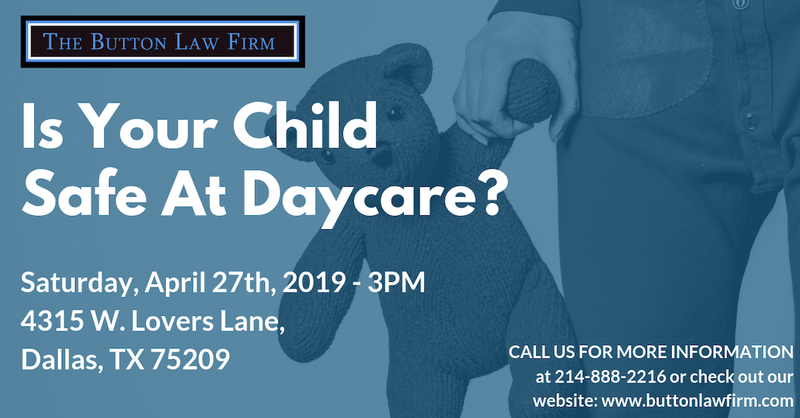 Give us a call at 214-888-2216, or fill out our "Contact Us" form on the bottom of this page, and let us know that you need the list of questions to ask a potential daycare negligence attorney. We will gladly give you that information! "What can I do to reduce the chances of my kid getting hurt at daycare?" We have written a guide on how to search for a great daycare that will keep your child safe. You can download our free consumer guide, 11 Tips To Help parents Choose A Safe Daycare, by following the link. If your child is already in a daycare and you noticed that the facility is missing some of the qualities listed, we suggest you search for a new daycare center as the article was thoroughly researched to ensure the daycare puts children’s safety first, not just see the children as profit. You can also follow our daycare series on YouTube to follow the consumer guide listed above. "What am I supposed to do after a car wreck?" Check out our article, “What Do You Need To Do After A Car Wreck,” to find step by step instructions on what to do if you are involved in a car wreck. If you still have questions after reading our article, please give us a call at 214-888-2216. "How do I know if I need a lawyer for my car wreck claim?" If you were involved in a car wreck but were not seriously injured, you likely don’t need a lawyer to get the claim resolved. I wrote a simple report for folks like you, that just want to know what to do and the steps that need to be taken. The consumer guide is called “Why Get An Attorney? Handle It Yourself,” you can download it for free on our website! "What is an insurance adjuster?" The insurance adjuster is not your friend, they will try and find any loophole to make sure they don’t pay you in full. They were hired specifically to save the insurance company money. Luckily for you, we have written “Secrets About Recorded Statements.” This report includes everything that the insurance companies hope you never read about. Within this report, you will find all of the questions an insurance adjuster will ask your during a recorded call to help you prepare. "Who will pay my medical bills until my case is settled?" We suggest submitting your bills to your health insurance company. If you don't have health insurance, you will need to arrange payments with your doctor or hospital. Avoid letting your bills go to collections because that will affect your credit score. Read our article, “The Car Wreck Was Not My Fault And I Have Medical Bills” for more information. We have created a full list of questions to ask an attorney to ensure yourself that the potential attorney will fit your case and your family the best. You can give us a call at 214-888-2216 or fill out our “Contact Us” form on the bottom of this page and let us know that you need the questions to ask a potential car wreck lawyer list. We will gladly send that information to your email! Trust us, you’re going to want to know the answers to these questions before making any decisions. Keep reading below to find out how to get your free car wreck toolkit. You can always call our offices and speak to one of our intake specialists to arrange an appointment with one of our attorneys by calling 214-888-2216. Every month we create a newsletter to keep our friends and family informed on what’s going on at The Button Law Firm. This is a fun non-lawyer-like newsletter which is designed to give you a break from your crazy schedule and enjoy a good read. We will give you advice that you can use in your daily life. We also include delicious recipes and funny memes! The best part about this program is that it’s completely FREE! Don’t pass up on a great opportunity and sign up today!